Based on customers feedback, while doing live search we now added several filters in the lookup window. 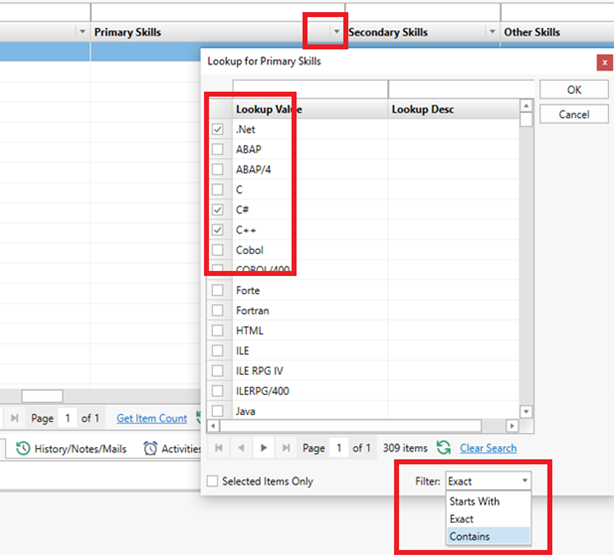 This below article explains you different ways to search the data in Exelare Live Search Bar with operators using GUI. All of these: Searches for data that just contains the words you selected without being the exact phrase. 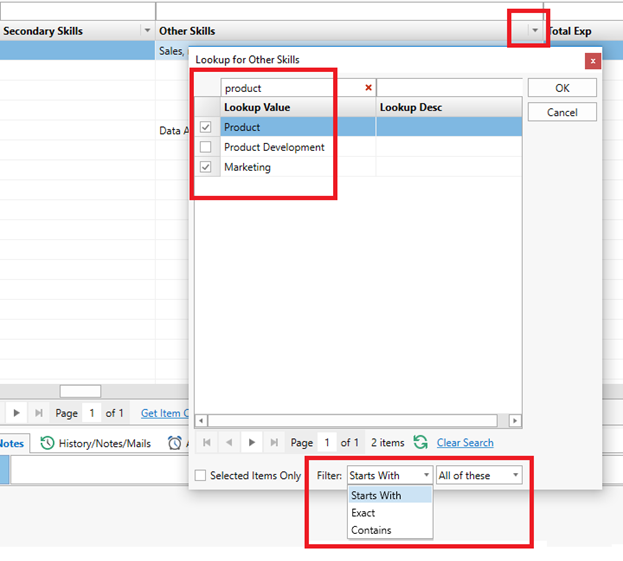 You can select (i.e., check) as many keywords as you want. Any of these: Useful when searching multiple keywords. 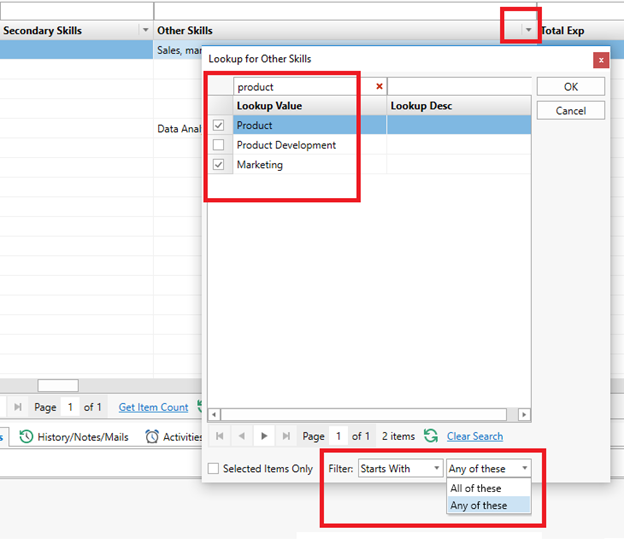 For example, you can find records that contain the word Product, Marketing or Java Developer. Starts With: Searches for data that starts with the word you selected. 1) Let’s say you want to search for “Product” and “Marketing” in “Other Skills” field. You can use the operators “Starts With” – “All of these”. 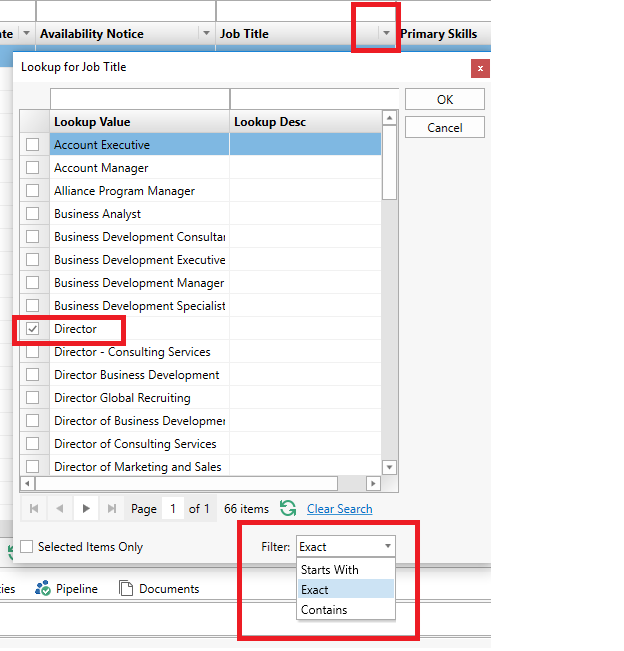 2) If you want to search for either of the keywords in a particular field. Ex: “Product” or “Marketing” or both. You can use the operators “Starts With” – “Any of these”. The EXACT operator can be used to retrieve records that match your search term precisely. For example: To search for EXACT keyword “Technology”. 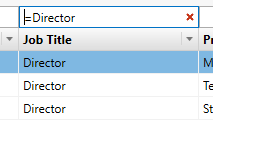 Choose the operator “Exact” in the Filters. This search will return results which have "Technology" in the field, but will exclude data that feature this phrase as part of a longer entry, such as "Technology Lead" or "Technology Consultant" etc. At the bottom of the popup window, choose “Exact” under Filters. Results: This does not show the records where job title like Director – Consulting Services, Director Global Recruiting etc. 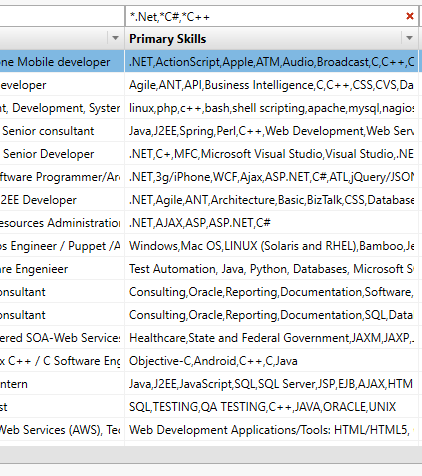 Let’s say you want to search for candidates who has the keyword either “.net” or “C#” or “C++” anywhere in the field. You can choose the operator “Contains” that behaves like a wildcard.